Welcome to Not Me! Monday! 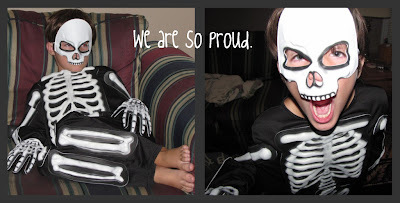 This blog carnival was created by MckMama. She is the mother to five and she makes me laugh and truly contemplate some pretty deep issues. Head over to her blog to read what she and her husband and precious children have been up to this week. It was not project-based learning weekend around our house. 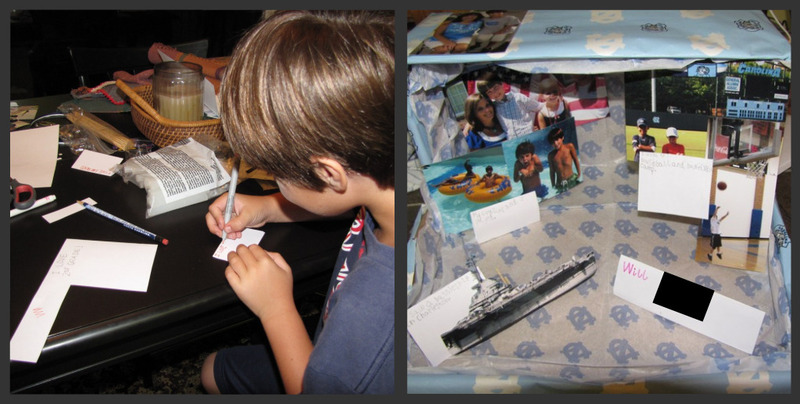 Will did not have to do an "All About Me" box that we had to special order wrapping paper for from an "un-named" aunt! We did not have to make an "All About Me" poster for Caroline...I am not secretly hoping that she will cry less because she can "see" us all day long now. And finally, I did not take my whole family shopping on Saturday. I did not let Will walk around with Mark. We did not come home with this costume. He did not have it on first thing Sunday morning. I am not so proud. What have you not been doing? I cannot wait to hear! I have been doing a lot of contemplating lately. I think because I am digging deep to try and figure out why Caroline is so upset at Pre-K, I am pondering life more than I normally do. I have always wanted my kids to feel like they could talk to me about anything. I have wanted them to feel like they could bring their friends over and feel welcome in our home. 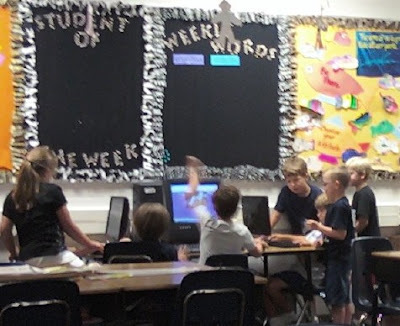 The other day I looked up from my desk at work and realized that I had 8 kids in my room playing on the computers, laughing and having a good time. While the noise was deafening, I smiled to think that perhaps we are headed in the direction of that dream I have (and yes, I know, he is only 7-- I know he probably won't even like me when he is in high school, but right now I am dreamer and I prefer to think he will still do the same thing later in life). I had a first this week. I took Caroline to cheerleading practice. Yes, you heard me correctly. I did not say it was an amazing first...just a first. And I have to say something. I was in SHOCK at the cheers they taught my four year old. So much in shock that I am not sure I want her to go back for more "practices". I do not know if I want to go into the words of some of the cheers, but I found myself pondering again. If we teach our precious daughters these mindsets, attitudes and (degrading) comments when they are (4), 5 and 6, what exactly do we expect them to become when they are 9 and 10 or 15 and 16 or 20 and 21? I began to think--"Paige, you are getting old--this is not that big of a deal." I agreed with her--yes, we do want the Bruins to win. But I stopped--and thought--where did she learn that we only cheer for the Bruins and that we want our rival school to lose? Oh...wait...that might possibly have come from her father me. My children will have many teachers as they grow (Lord willing, that will include Caroline and she will actually learn to enjoy school) but the teacher they will learn the most from is me. Now, I don't say that because I AM a teacher, I say that because I am their role model for the things of life that cannot be learned in a classroom. And so I must ask myself: Am I teaching them the right things? Or am I filling their minds with empty words and meaningless experiences? I have been given an awesome responsibility and it is not one I can take lightly. They are what I teach them...by example, with words, and in my actions. Lord, that I may be worthy of the task.
" Fix these words of mine in your hearts and minds; tie them as symbols on your hands and bind them on your foreheads. Teach them to your children, talking about them when you sit at home and when you walk along the road, when you lie down and when you get up. Write them on the doorframes of your houses and on your gates..."
I have a public service announcement about WIWW. I love linking up and seeing what everyone wears and I think it is fun to do a blog post that does not require a lot of thinking on my part (well, except for remembering to take the pictures and all....), but I have gotten some flack from people who read my blog about WIWW. I realize that this is not a thought provoking blog. 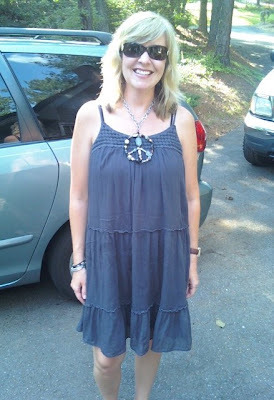 And, yes, some of my posts are lessons that God has been teaching me and one might ask how can you write about clothes and then be all deep about God. Well, because, putting together outfits that look nice is not ungodly. In fact- I am a daughter of the King of kings and so that makes me a princess. In being a princess, I must look the part. Yes, it is more important for me to look the part in my heart, but I don't have to be a bum because I love Jesus. I am not saying in order to love Jesus you have to be cute and stylish--but on the flip side you can also love Jesus in cute outfits and accessories. And now, without further rambling, here is WIWW--link up over at Lindsey's blog and check out the style all around the world! I did not have a slight meltdown when my four year old told me (as she did those hiccup-type cries) that she did not want to go to preschool because she just wanted to be with me. She did not add to that the reason she cries: it was not because after nap time other moms come pick up their child and I am not there. :( My heart did not break in two. 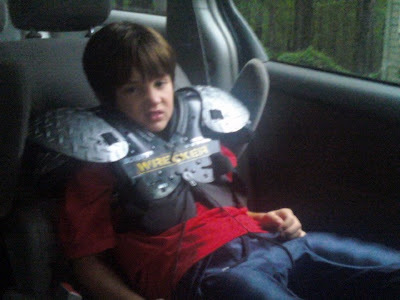 My precious seven year old did not have football practice on Saturday. He did not get there to find out that he has 27 other children on his team. Oh my. 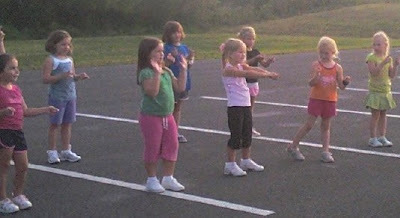 Surely the rec department did not put that many 7 and 8 year olds on ONE team! I did not come home from work and sit down and wonder how long I had to stay awake until it was acceptable to go to sleep for the night. I would never do that--I can surely stay up longer than my kids. I am not at all excited for my friend Renee who is right now in China picking up her sweet daughter Sarah Ren. You cannot keep up with her travelings over at her blog. For Whom Do You Run? "My name is Paige, and I am a runner." Not really. I want to be able to say that, but I can't. Yet. Ok...so maybe endurance athlete is not on my name tag. I am not a runner. I would almost say I loathe running. Almost. It is a love hate relationship--I hate doing it and it loves to torture me (just kidding--not really). I do love the END of a run and I am getting there with learning to LIKE running. You are probably thinking...why are you doing something you so totally don't want to do? Yeah, I know what it looks like. I have lost it. That is a totally legitimate thought and probably would not take much debate to prove true. But that is not the heart of the matter. See, there is this class at my church that got started in January called Run for God. The leader/author of the book is a friend of mine. I prayed for the class that started in January and silently thought, "Whew. I am so glad I am not in that class." Guess who is now in the second Run For God class? Yeah, really. It is me. You cannot really argue with God (don't ask my friend Lynn about this...she says I am the only one she knows who DOES argue with God---and just so you are clear--I don't ARGUE like you would with a spouse--it is more like a whiny child.) when He tells you He wants you to do something. "Paige, I want you to do this class." "But God, I am not a runner." "I know. I want you to do this class." "Uhm, Lord. Do you not remember what happened in fifth grade when I came in dead last in that 5K?" "Yeah. I remember. So what?" "What if it happens again? Can you promise me it won't happen again?" "Paige, do you trust me? "Paige? You say you are not a runner and I am asking you to put your fear of coming in last aside, and let go of your contempt for running and do this because I have asked you to. This way, you cannot take any of the credit and you will be completely dependent on me." "Yes, Lord. But, I am also crying. I don't want to do this." "I know. But I want you to." 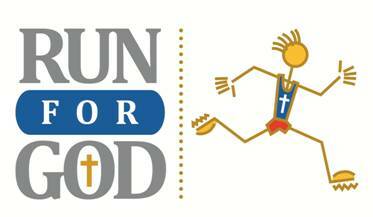 And so I joined Run for God. It is changing my life. I even have a running buddy! She is awesome. She is faithful. (She is tall-so her one step is like 10 for me--but she is a great running partner). I love the time I get to hang out with her while we do our workouts. 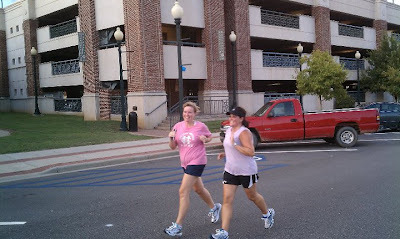 If I did not have her running beside me, I would not have made it through our last few workouts. 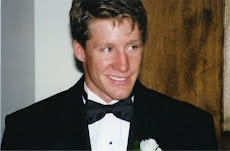 I have realized how important it was to have accountability. Then Thursday night, I learned something even more amazing. 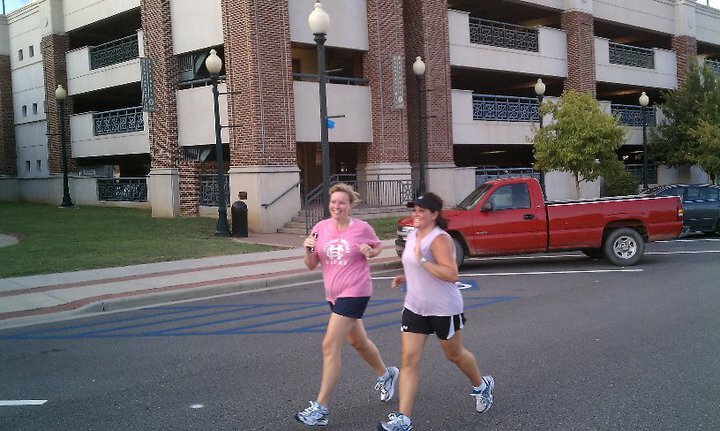 We did a practice run of our 5K (that we have to run on October 16th). 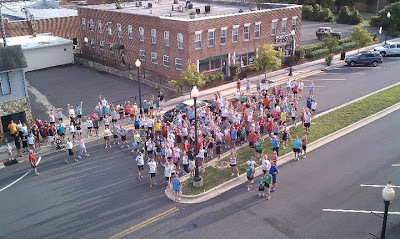 I have no idea how many people were there...but we did our Bible study and then we ran. And as we ran, I was amazed. Sure, my legs hurt and my lungs were screaming at me to stop...but what I heard was God. He was all around us...in the encouraging words of complete strangers; in smiles and pats on the back; in laughter and even in the moans and groans. That path was full of the face of God--and while it took a while to finish, it did not seem long at all. But Friday, when I drove down the road we had run down the night before, I thought..."Wow, this doesn't feel like it will ever end." And then it hit me. Any road you walk on alone does seem long. And bleak. And daunting. But fill that same road with the people of God and suddenly it takes on a whole new light. A light worth running for. A light worth running towards. A light I hope I can help to spread. All because He asked me to run. And, while at first I said, "No, thanks", He promised me it would be worth it. And Thursday night, He lived up to His promise (He always does, by the way). He showed me how I can run well WITH Him, but by myself, I am hopeless. He is my strength on the running path and He is my strength in every step I take in life. Without Him, I will never cross the finish line...but with Him...I know I will cross it with my hand raised in honor to Him and a smile on my face (and with my running buddy next to me). 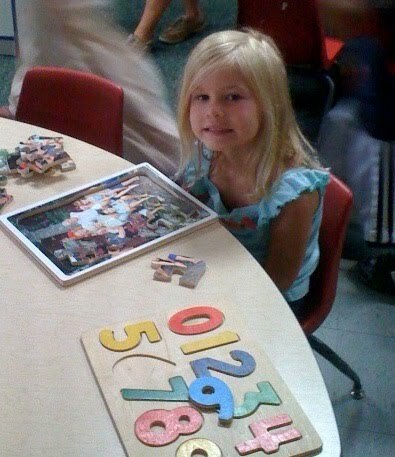 So, Caroline started Pre-K....remember her fake smile? And I thought all was going well. She seemed happy when I picked her up. She told me all about her day and how much fun she had playing with her new friend. She has not been upset at night when she goes to bed and is excited to help pick out her outfits for the next day. But then she started saying she was crying when the teachers weren't looking. And that she was just so sad to go to preschool. But she had been OK when Mark had dropped her off. And then today, Mark texted me after he dropped her off and it said, "She CRIED when I left her." Oh my. So when I got there to pick her up, she looked so sad. She was sitting in circle time but she wasn't really participating. She saw me, jumped up and flew straight into my arms. I asked her why she had been crying and she said, "You know when you feel like you have to cry but you don't want to? Well, it was just too hard to hold all those tears in anymore. So I cried." 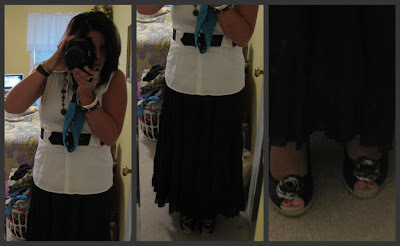 Check out more (probably more detailed and stylish) outfits over at Lindsey's blog. I did not do so well this week snapping pictures. Sorry. 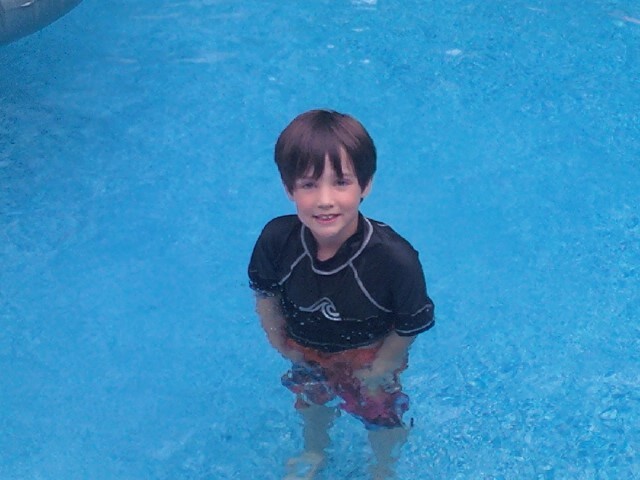 I AM putting them all together in my "just learned how to do thanks to Denise" picnik collage. I love the all together look of this and I will make these better in the future, I promise I think. Really, I am sure you don't care that much where everything is from...except maybe #4...cuz I am looking stylin' and I know you all want to copy me. :) That is my running outfit. 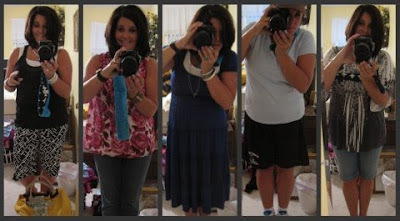 I am doing a class that I think I will talk about soon and that is me right before heading out the door to meet my running buddy! Everything else, think Loft, Gap and Steinmart! 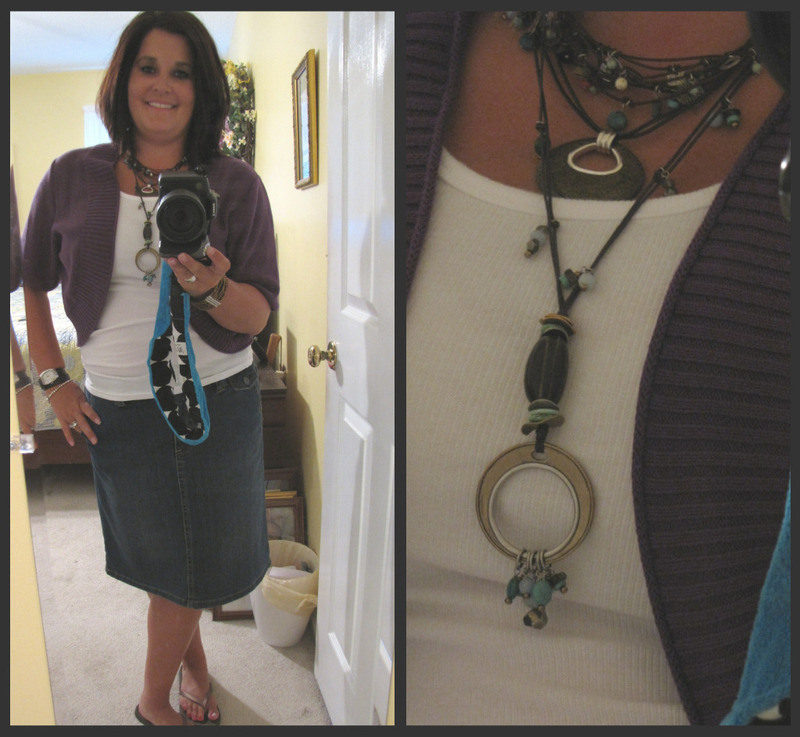 The bag in the first one is from Pleated Poppy...and I LOVE it. Can't wait to see you ALL in your outfits...link up! It was a big day in this household yesterday. 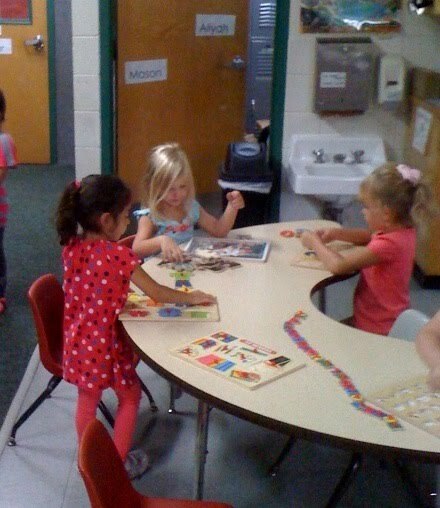 Caroline, my sweet baby girl, started Pre-K. I thought I was ready for it...I love how she is growing up into a little girl. But somehow, yesterday, I did not like that she was starting school. Even if it is Pre-K.
Mark took her for her first day and I threatened him within an inch of his life if he did not take pictures and give me an update immediately after he left. He did a great job. She was real quiet when they got there and just sort of stood there, looking around. Her teacher spotted her and went to her and engaged in her some puzzle work. Mark took her picture at her seat and her smile is so fake. :) Nerves. They get me too...but it made me sad for her. Mark told me around lunch that he wanted to go over and check on her. :) (his office is SUPER close to her school). He didn't go. Secretly, I was hoping he would! We left from picking her up, ran by the grocery store, went home, cooked and ate dinner and then left to sign Will up for football (insert mean growl here). He got his gear and wanted to wear it home. :) This is his mean face. Aren't you scared? I am exhausted. Getting up super early and having to WORK is about to kill me. I do NOT have a second grader. It is not possible that I am old enough or that HE is old enough to be in the second grade. His teacher did not wear his favorite color on the first day for him (she really didn't do it FOR him...but it was a bonus). He did not have a great day and he is not excited about going back today. Today is not her first day of preschool. I am not super sad that I can't be there to take pictures. Her father was not threatened with severe punishment if he did not take pictures of her in her room. This guy, after hearing his sister butter me up earlier in the night, told me he loved me and daddy very much and he was locking that love up in his heart where it would never leave! :) I do not who these kids are but I hope the love fest stays around for awhile! It is pretty easy to love on these kids no matter what they do or say---yesterday just made it all sweeter! Today is Wednesday. I usually do not mind Wednesdays. Except today...I had to go back to work. :( :( I do not like the end of summer...at all. 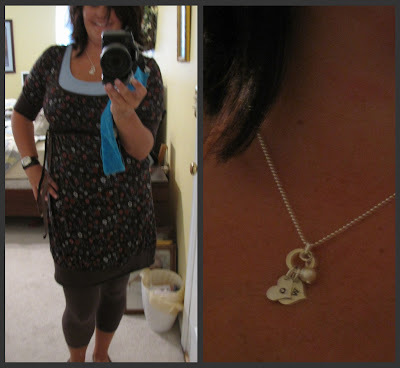 But I do love What I Wore Wednesday over at Lindsey's blog. Check it out. Do you remember this post last week? It is the one about being desperate for God. Desperate=hopeless. Hopeless=inadequate for the purpose. Am I inadequate for the purpose of my life without God? Am I so inadequate that I cling only to Him? My lack of an answer is my answer. I am certainly inadequate--that I will admit. But because of my inadequacies, do I grab a hold of the One who knows everything, everywhere, all the time? No. I am too selfish to do that most days. I have my own agenda. I have my own plan and timeline. And God has had just about enough of me. He is yanking out from under me all the magic carpets I have tried to ride in hopes of reaching MY goals. He is showing me how those carpets that may look pretty, that may be able to do amazing things, that may make me laugh or feel good about myself are really an illusion. A mirage. A false sense of peace in the midst of my crumbling world. They put on a good show though. When my foundation starts to wobble, they woo me onto them and take me away momentarily to what I think is solid ground. In fact it is not. It is just the mountain I have built with my idols. I have stacked them up one on top of another and they have formed a false sense of security and stability. But God is removing those idols. And as one is pulled from the stack, the whole mountain shakes and teeters and rocks. And if I reach to grab on to the mountain, I see it begin to fall. It is not solid ground. It is sinking sand. And I am tumbling down with it. It is at this point, this HOPELESS point, that I cry out to God. Should He answer me? No-not if you base it on my actions. Does He answer me? Yes. He answers me for one reason and one reason only. He loves me. He loves me enough to save me from my idols. He loves you too. I don't know if you are a Christ believer. If you are not, I would love to tell you how you can have hope in a hopeless world. If you are a Christ believer, then I urge you to search your heart for those things that are more important to you than God. Or maybe they aren't MORE important to you, but AS important to you. And then ask God to help you let go of them. Life on the other side of Idol Mountain is lush and full of life. Are we desperate enough to let that mountain crumble so we can see the Hope of life with Him? Mark did not come home one day from work to pick up Will for a quick round of golf. 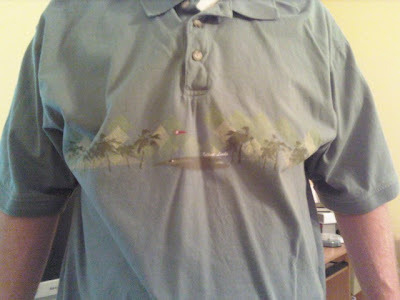 He did not change clothes, saying he needed to wear more golf appropriate clothes. This is not what he picked out. I was not embarrassed for Will to be seen with him at all. Caroline and I did not go get pedicures while the boys (and their goofy shirts) golfed. 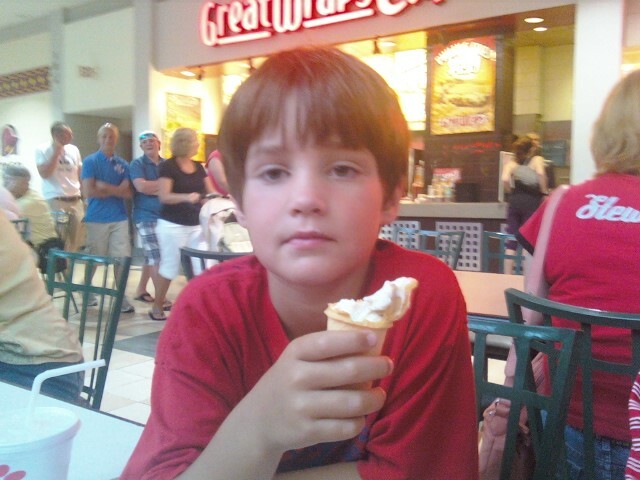 Ice cream is not a major part of our lives (except mine...I think I have ice cream intolerance in my old age). 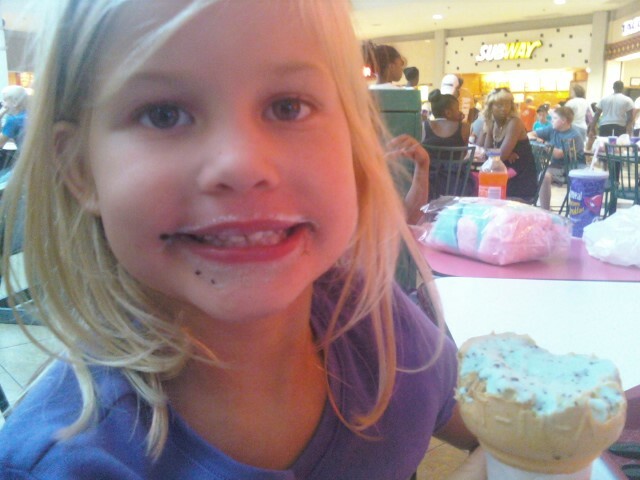 Caroline does not try to share her ice cream with her whole face. 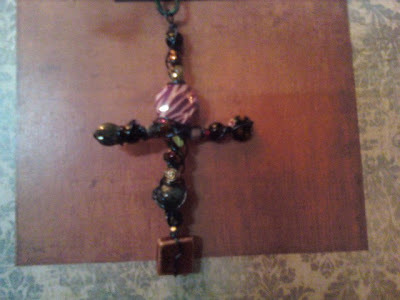 I did not get to go to a cool vendor display in town and did not get this cool handmade cross. I did not go to church yesterday where our pastor preached again on being desperate for God. I will not be sharing more of this soon!